After months of speculation, tech demos, beta tests, controversy over Origin and teaser trailer after teaser trailer, Battlefield 3 is finally here. There’s a lot of pressure on DICE and EA’s latest, greatest man-shoot too; the developers have talked about making a ‘proper PC game’ and not simply developing for the consoles and porting to the beige (or is that black these days?) box. Can BF3 really live up to the huge hype? Does it survive Origin and Battle Log’s online integration? And most importantly, is it any good? 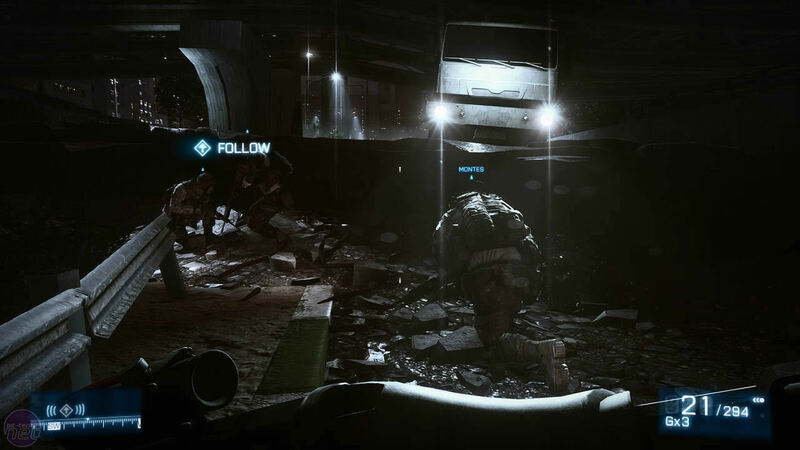 To answer that most important question, you need to consider BF3 as a game of two halves. 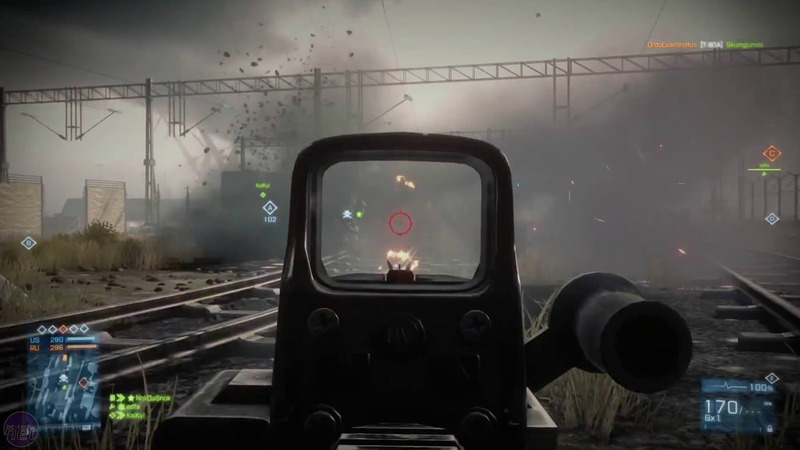 In a first for the core Battlefield franchise, BF3 3 is equipped with its very own single player campaign. It’s a globetrotting, flash-back based affair that plays like something of a greatest hits from every first person shooter from the last 6 years. The HALO jump from Crysis? That’s in there (minus the squid-alien). The AC130 section from Modern Warfare? That’s in there too, now with added air-to-air dog fighting. There’s sneaking through ruined buildings sniping enemies in the dark, taking out tanks with hand held rockets, and defending shopping malls from zombies angry Iranians. Basically, it’s all the stuff you’ve come to expect from a modern FPS, and it’s accomplished efficiently, if not with flair. What’s more disappointing is that DICE hasn’t chosen to be more innovative considering the potential of its remarkable Frostbite 2 engine. Even Battlefield: Bad Company 2 allowed some feeling of freedom, letting you demolish houses and blow your way through walls to enemy positions. BF3’s campaign is cripplingly linear, almost to the point of comedy. It doesn’t just funnel you through streets and walkways from set piece to set piece; in some missions you’re effectively a passenger watching the game play itself. There’s no option to drive your tank right through the enemy buildings; no way to demolish the entrance to a building to secure your flank. It plays the same as most other modern shooters, holding your hand and not letting you go far from the scripted path. BF3 even goes one step further on occasion though, simply killing you and making you go back to last check point when you miss a shot or melee takedown. It’s repressively linear and from a game which champions its open world engine, its a disappointment. Despite its linearity though, BF3’s campaign does at least clip along at a great pace, pinging between multiple characters to give you a taste of trains, planes and automobiles (if tanks count as automobiles). Unlike many of its ilk, its constant globetrotting doesn’t get repetitive either - there's just enough variety to keep the new environments and ways to shoot people fresh. It’s the graphics that set BF3 out from its competition though, and several times throughout the campaign our mouths were on the floor at the digital wonders our graphics card was somehow rendering. Stunning lighting, particle and smoke effects are better than anything else we’ve seen and while there are some holes, such as how the NPC facial animations remain disappointingly stoic, they don't ruin the experience. BF3’s campaign is as much an advert for the stunning potential of the engine as it is an enjoyable, but unoriginal romp through Europe and the Middle East shooting stuff. And it is enjoyable, in the same way that a Michael Bay film is enjoyable. There’s minimal attempt at character development or originality, lots of things explode and collapse in a variety of entertaining and visually impressive ways, and there’s some improbable plot about nuclear weapons. Start thinking too hard and it all unravels but, for the most part, you’re able to gloss over the linear gameplay and just enjoy the ride.